Partly cloudy skies early. Thunderstorms developing late. Low 68F. Winds SSE at 10 to 15 mph. Chance of rain 80%.. Partly cloudy skies early. Thunderstorms developing late. Low 68F. Winds SSE at 10 to 15 mph. Chance of rain 80%. 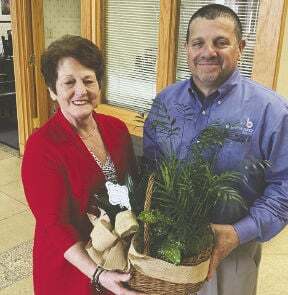 The WBR Garden and Civic Club presented a ‘Brighten Your Day’ bouquet to Business First Bank as the January recipients.